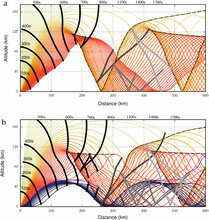 Multiple-scale asymptotic analysis is applied to small-wavelength, weakly nonlinear propagation of an impulsive acoustic wave in a general (3D, in-motion and time dependent) atmosphere. In keeping with previous work on sonic booms and nonlinear acoustics in general, the result is a combination of ray tracing and a generalised Burgers equation describing evolution of the waveform carried by a ray. This is nonetheless, to our knowledge, the first derivation of such a model based on asymptotic analysis of the governing equations for a general atmosphere. Results are given, discussed and compared with measurements for the particular example of the test explosion known as Misty Picture.